The post-war in Liberia, like any conflict of its kind in the world, left behind factors that fuel the sexual mode of transmission of diseases including HIV. In keeping with UN Security Council Resolution 1308 (2000), all peacekeepers are required to go through a mandatory awareness sensitization and prevention training on basic facts on HIV/AIDS, personal risk assessment and cultural risk factors to HIV/Sexual TI transmission in post-war Liberia. Monrovia, Liberia: The post war in Liberia, like any conflict of its kind in the world, left behind factors that fuel the sexual mode of transmission of diseases including HIV. In keeping with UN Security Council Resolution 1308 (2000), all peacekeepers are required to go through a mandatory awareness sensitation and prevention training on basic facts on HIV/AIDS, personal risk assessment and cultural risk factors to HIV/Sexual TI transmission in post war Liberia. 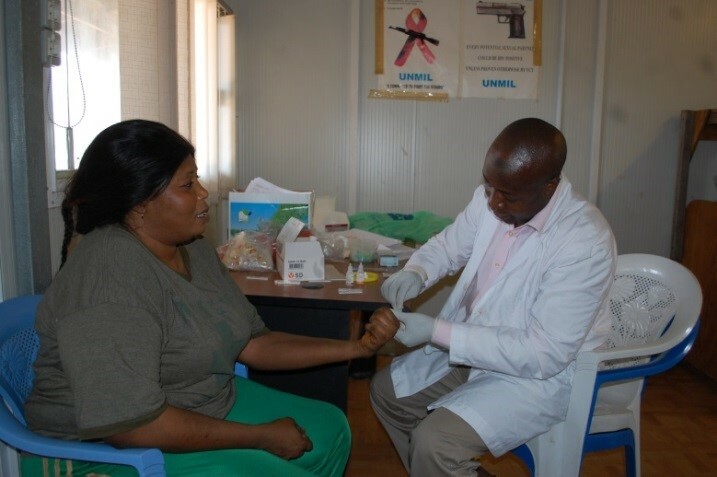 I arrived in Monrovia, Liberia, in July 2012 and joined the United Nations Mission in Liberia (UNMIL) HIV/AIDS Unit to serve as an HIV/AIDS Officer for Counselling and Testing. Every two weeks I was required to provide training sessions to all new arrivals to the mission, including international and national staff, UN Volunteers, contractors and uniformed personnel, in collaboration with the Integrated Mission Training (IMTC). The aim was to go beyond raising awareness and change risk behaviours of peacekeepers. Some of the other activities I undertook included conducting voluntary counselling and testing to UNMIL personnel, both onsite and with visits to the contingents at their various camps situated all over the 15 administrative divisions across the country. Visits to the-various locations afforded us the opportunity to appreciate some of their challenges, and learn to deal with them as best we can. It also allowed the peacekeepers to ask and get direct responses to questions regarding our services. When Ebola appeared in Liberia, we had to combine our preventative awareness training on both Ebola and HIV. Not everyone was pleased to see us and not everyone gave us the welcoming smile, but in the end, all appreciated the preventative messages. I also serve as the alternate to the head of the HIV/AIDS Unit any time he is out of the mission area, and at times I am directed to represent him at some meetings and fora. Serving in this capacity afforded me the opportunity to meet and exchange ideas with top management staff at the country level. From time to time, we received invitations and requests to attend and provide training and skills transfer sessions to different groups. Volunteering, as with life, cannot go without challenges. Sometimes you hear someone say "He is just a volunteer, I wonder why he is giving himself this hard time." I come from a deep place of humility and respect, but such statements are demoralizing, stigmatizing, and convey a perception of unimportance. At other times one gets satisfied as one is able to put a smile on someone’s face and restore their hope. Someone said to me one day: "Please, don’t minimize your impact here." So I would like to say volunteering is important because we all count, we all care, and we are all needed. Please receive this gratefulness as a breath of fresh air and allow it to warm our hearts as we continue our important tasks.